Last post show "Apply Animaton in JavaFX Charts with Timeline", and mentioned the BarChart show wrong graph if setAnimated(true). In order to show the behavior, the example is modified to create two BarCharts to show the same data. 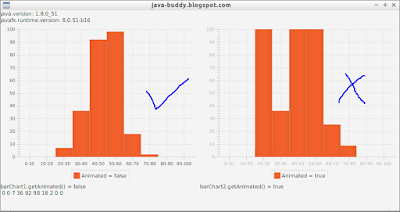 The BarChart on left side with setAnimated(false) show the correct graph, on the right side setAnimated(true) show the wrong graph.